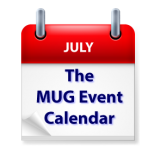 July’s MUG Event Calendar wraps up with a Florida group’s session on creating a blog, a Michigan group’s review of accessibility, and a California creative pro group’s presentation on a variety of video production topics. Los Angeles Creative Pro Users Group – “We will welcome back Jon Chappell, lead developer from Digital Rebellion, who will take us through the major Kollaborate update that drastically expands the power of Workflows. Kollaborate, if you do not know, is a cloud based system for video collaboration.